After two successful Dakar Rallies, the time came for Rafał Sonik to take up the next challenge – the FIM World Cup in cross country, i.e. five rounds of racing in the most unfriendly terrain on our planet. The Cracovian warmed up only at the first stop. In the following legs, he drove in phenomenal style and won the rally’s trophy. The Abu Dhabi Desert Challenge was not an easy round. A year earlier, Rafał Sonik broke an arm here which excluded him from starts for the rest of the season. The spell had to be broken. And so, SuperSonik came in fourth which, as it turned out, was only a prelude to what was to happen later in the rally. Tunisia was not friendly for the drivers. The drive in already difficult terrain was made even more unbearable by strong winds and rain. In such conditions, it was the Polish quad rider who managed the conditions the best and left the competition behind during the first rounds. Victory in the second round ensured him the position of a leader which he maintained by ranking second in the Sardinia Rally. Then, the time came for the most important test, i.e. the ten-day Rally Brazil, often called a “Small Dakar.” Here, SuperSonik got two historic results: he was the first foreigner to win the rally in the quad class, thereby the first Pole in history to win the World Cup in rally sports. In the season-closing Pharaoh’s Rally, Rafał Sonik was haunted by bad luck and had to repair his quad again and again. Fortunately, the Pole had victory already at hand, so he did not have to be nervous. With constant determination and good humour, he ended the races in Egypt in second place. After his successful start in the Dakar Rally, Rafał Sonik decided to try his skills again in the FIM World Championship. The Polish rally driver passed his first exam in Abu Dhabi with flying colours, successfully finishing the competition in the United Arab Emirates to finish fourth. A year earlier, the Cracovian had made his debut in this prestigious cycle although with little luck as he broke his arm during the first leg of the first round, which excluded him from competing for the trophy. This time, having learned his lesson, Sonik drove assertively and carefully. Above all, he tried not to make mistakes and this strategy brought him the fourth place in the Abu Dhabi Desert Challenge. – summed up Rafał Sonik who did not manage to avoid adventures in the rally. In the fourth leg, Sonik towed the rally’s leader, Sebastian Husseini, and when the sand had become too deep, the drivers ran alongside their vehicles so that they could move forward at least a bit. During the OiLibya Rally the drivers had to cover 1848 km, in which special legs were 1331 km. In the difficult to navigate and unfriendly terrain, it was Rafał Sonik who did best and won his first important victory in the FIM World Championship cycle. As Sonik mentioned, the first leg was an utter maze in which he felt surprisingly comfortable. – said Sonik at the finish line of the first leg which he reached as the first competitor in the quad category and ranking thirteenth in the whole rally including motorbikes. The following legs were only better. Rafał Sonik was fearless, disregarding the strong winds, rain, mechanical breakdown of his quad or a fall resulting in a severely bruised finger. He continued undefeated and won legs day after day. 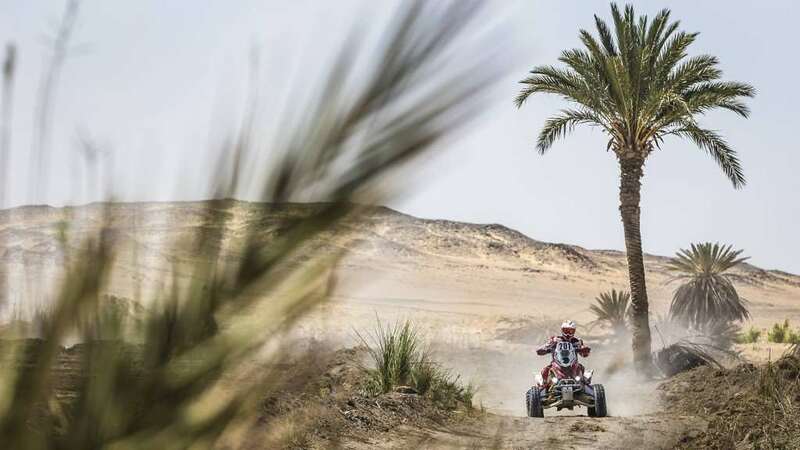 The last two days, he held a strong lead, thanks to which he scored a historic victory and also finished the rally in Tunisia, ranking eleventh in a joint classification of quads and motorbikes. The Sardegna Legend Rally was a leg in the FIM World Championship which tested the competitors’ technical skills. The route was rocky, gravelly and full of boulders. It meandered though narrow mountain paths at high altitudes. Rafał Sonik reached the finish line second, just behind his most serious competitor Dmitri Pavlov. Although second best, he managed to maintain his leader’s position in the general classification. Carried by his excellent result in Tunisia, Rafał Sonik also showed his rally class from the very beginning in Sardinia. He remained beyond the reach of his competitors until the fourth day of the rally when he had bad luck and a serious failure of his quad. The Cracovian lost three hours to replace the burnt clutch. This was sufficient for Pavlov to take the lead, which he maintained until the end of the rally. The breakdown was caused by mistakes made by the organizers when delineating the rally’s course. – said the deadly tired and furious Cracovian after the unfortunate fourth leg. Despite difficulties and a significant loss, the World Cup leader showed that his place in the rankings is not coincidence. His fortitude and ambition led him to the finish line ranking an excellent second, which gave him increasing hopes for the final triumph in the whole cycle. The dos Sertoes Rally in Brazil was one of the best backed rounds of the World Cup. 155 teams from eleven countries took part in the rally. The course led though a completely different terrain compared to previous locations and the participants had ten days of competition before them. After the Dakar, this was the second most difficult rally in the world. So much greater was Rafał Sonik’s achievement in the quad group. The Pole was the first driver from outside Brazil who won the so-called “Small Dakar.” Moreover, first place in South America meant winning the World Cup for the 2010 season at the same time. SuperSonik built such a great advantage over other competitors that de facto he wouldn’t have to take part in the last Pharaohs’ Rally because he would have lifted the trophy anyway. – said the newest champion at the finish line who, just like his competitors, had covered over 4500 kilometers of dust, mud, rivers and sand. Rafał Sonik began the last round of the World Cup as already the winner. Not burdened with pressure, the rally driver continued the Pharaohs’ Rally with calm confidence, completing the race ranking second. It was very tough. I thank you all for being with me. This cup is also yours. If not for the fans, friends, the whole team and my family, I wouldn’t have done it. Thank you! – SuperSonik summed up the whole cycle. In Egypt, the Cracovian was under an utter pharaohs’ curse. In the first leg, the gearstick broke and he had to spend an hour fixing the breakdown. In the 250th kilometre, he had to ride with a flat tyre; then he broke a steering dumper, to fly over the handlebar, injure a shoulder and batter the already damaged quad. All in all, over the entire rally, SuperSonik got almost ten flat tyres, but managed to keep his determination and optimism. In the Sahara, Marcos Patronelli, an Argentinian, was beyond other competitors’ reach. He was unable, however, to threaten Rafał Sonik’s position in the general classification. Therefore, Sonik, the first Pole in the history of the competition to do so, reached for the FIM World Cup in off-road races.